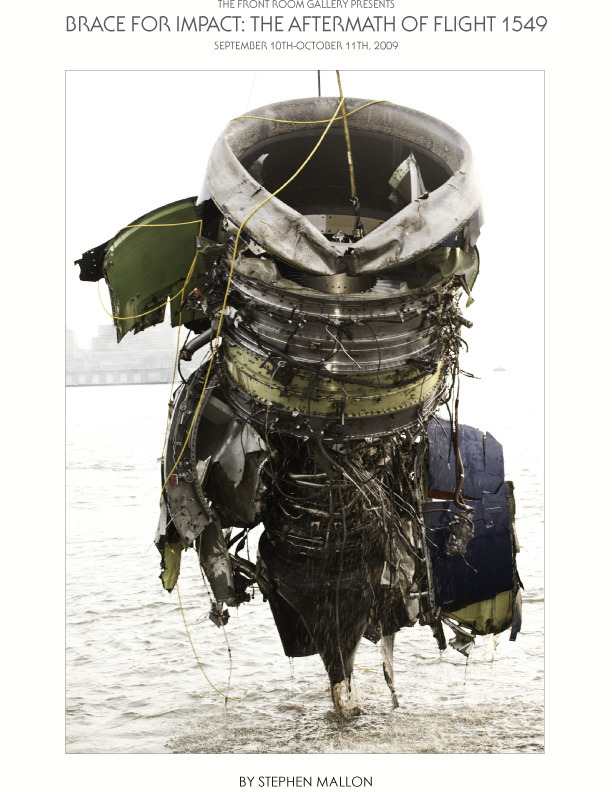 THE AFTERMATH OF FLIGHT 1549. There are only a limited number of copies left from the Second Edition. The Third Edition will be limited to 250 copies. Never before has a commercial aircraft crashed in the Hudson with the complete survival of all passengers and crew. Rescuers included crews of the Circle Line tour boats, Army Engineers boats, and a Staten Island ferry support vessel, as well as the boats from New York Waterway. Men, women and children waited their turns patiently standing on the wings of the plane, half-submerged in the icy water on what felt like the coldest day of the year. This feat is a testament to the bravery of the crew, passengers and rescuers. As the fuselage and engine of the aircraft were later brought up intact by a gigantic crane and a team of divers in heated wetsuits, Stephen Mallon captured the moment standing on the deck of the crane-barge. In Mallon's uncanny photographs the plane sometimes appears to be a metaphorical wounded animal, like a whale lifted completely out of the water. It is damaged, beat up and missing one of its engines, but it nevertheless survives. The divers, in their heated wetsuits with huge face-gear, seem like astronauts floating through an icy void in space. And, we finally get a glimpse of the famous engineÑdisabled by some unfortunate Canadian geeseÑin a stunning pseudo-portrait by Stephen Mallon as it is lifted from some eighty feet of icy water.